Five Card Draw is widely regarded as one of the simplest poker variants and for that reason it’s a great place to start if you’re new to poker. Five Card Draw belongs, as the name suggests, to the poker family containing the ‘draw’. This means players can replace one or more of their cards with replacements from the unused deck. The aim of Five Card Draw is to create the strongest possible hand of five cards or use your bluffing skills to convince the other players that this is the case. 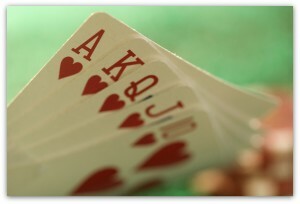 If played in a casino there will be a dealer, otherwise one of the players acts as the dealer and this responsibility moves clockwise as the game progresses. The usual maximum number of players is six with a minimum of two. Play begins with five cards being dealt to each player; the small blind is the player to the left of the dealer while one place further round is the big blind. During home games an ante soften used instead. Betting may be limited to the value of the blinds or unlimited, depending on the nature of the game. Any players now remaining in the game have the opportunity to replace one or more of their cards. The dealer will replace the same number which have been discarded. A second betting round now occurs during which players have the same betting options as before. When this has been completed the hands are compared according to standard hand ranking. As you can see it’s a pretty simple game which gives a solid insight into draw poker, betting and bluffing.